Is your firm actively involved in delivering packaged goods to contacts? One thing that customers will use to judge whether you are worthy doing trade with, is how you present items, and this includes everything to do with packaging. After acquiring all the other necessities and putting them in place, you still need to find a nice Vacation Packing List Template. In it, you should clearly outline the items packed, their quantities and prices. You can also see Inventory List Templates. Since this list is treated as a business document and is likely to be stored for future reference by the receiver, it should have a touch of officialdom. It is important that your represent your business logo somewhere within instead of just putting a name. Apart from enhancing uniqueness, this will also serve as a means of advertising. All recordings should also be done in a legible and organized manner. 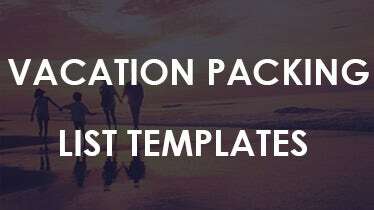 High quality Vacation Packing List Template provide enough space for such representation. kkfreight.com One of the most crucial and difficult tasks while going out with kids is to plan and pack all the essential things that they will require on a holiday. The Kids Vacation Packing List Template is one of the ideal solutions that can help you decide, plan, and pack all the required things, clothes, medicines, and other necessary things that your younger ones may require during travel. As the name suggests, the Business Travel Packing List Template assist in reminding you all of the essential items that you require to pack while planning for a business travel. Since most of the businessmen and their associates reside in world-class hospitalities, you may not require basic elements. The detailed checklist available along with the template assists you to cross-check everything before you finally leave for the travel. The Shipping Packing List Template is one of the easiest solutions to track your belongings and items while shipping them across locations. 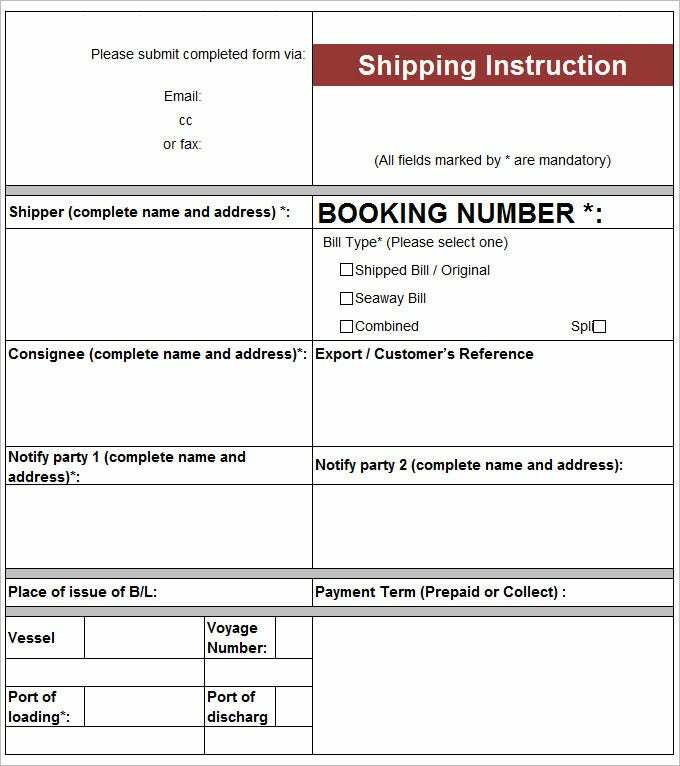 The template includes various sections that can be easily modified to be presented as a bill of lading or can be used to give the details of the shipment. It contains various sections to describe crucial factors including shipment weight, products included in the shipment, arrival and departure date, and other details. 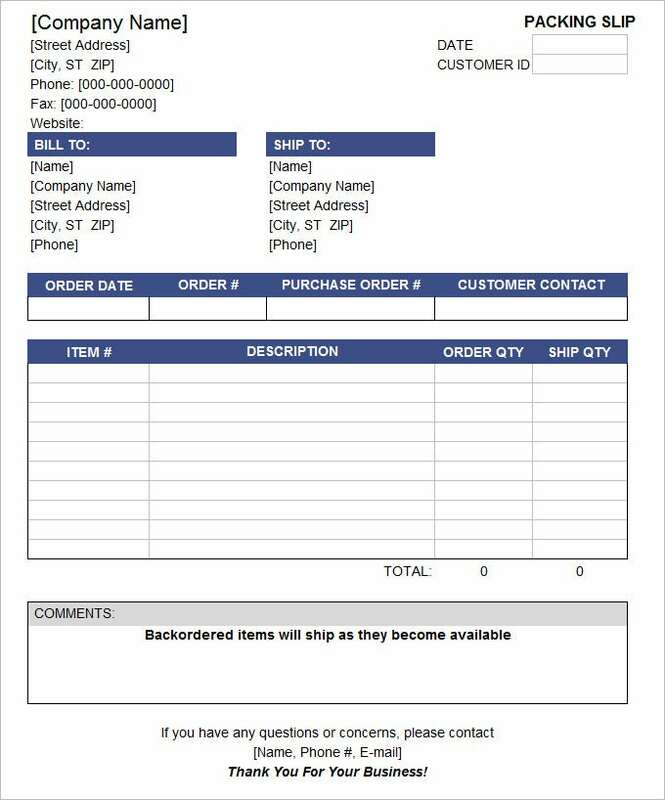 The Packing Slip Template can be easily transformed into a sales invoice template by simple tweaking a few headers and sections. 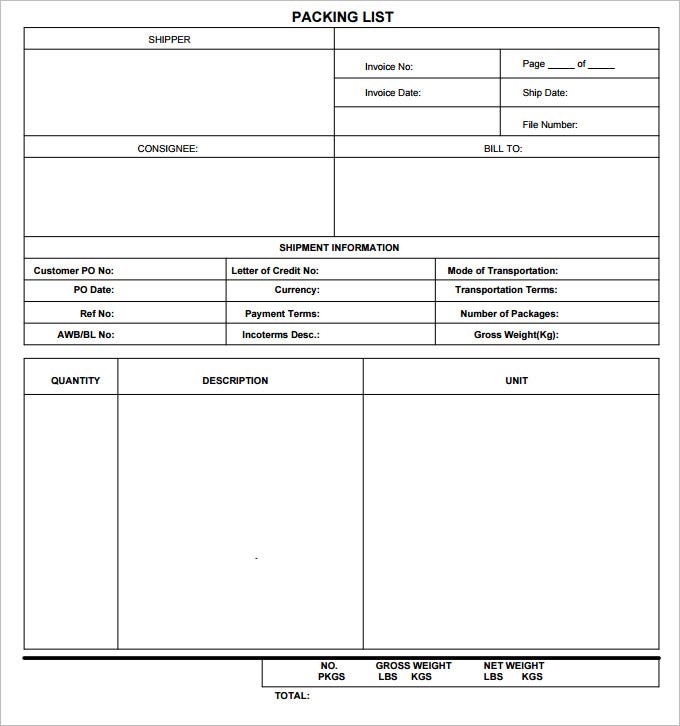 Since most of the companies includes an invoice along with the shipment consignment, these templates can be easily used to provide a corresponding packing slip that contains details including name of the sender, items in the package, single or multiple box packaging, and others. 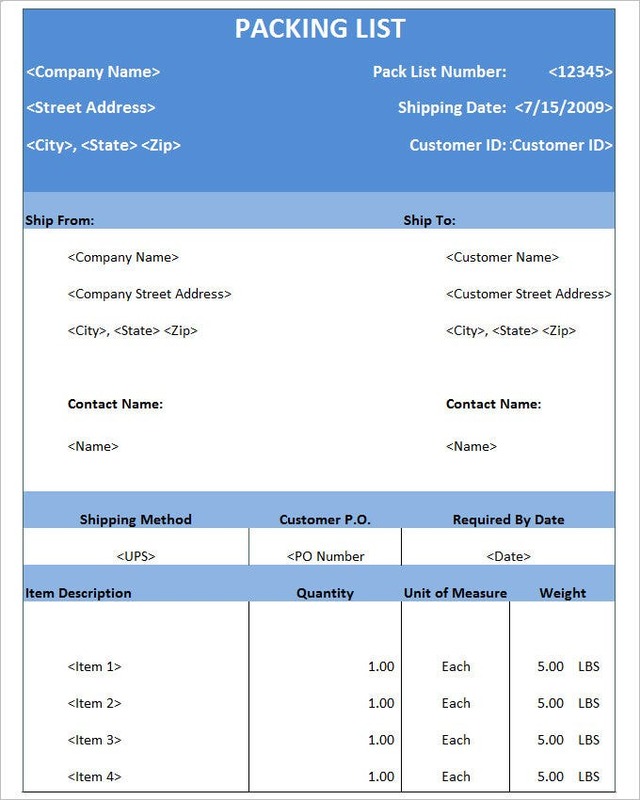 Instead printing different kinds of list every time you send items out, have a standard sheet that is unique to your firm. You can either find ready made packing list templates online and use them as they are; or come up with your own using the tools provided by these websites. Doing this in a way gives a long lasting impression of your business’ devotion to quality. Since users have diversified business and personal needs, many a time they ends up struggling with items that they require carrying during a vacation or travel. All of these templates can be easily customized to assist in creating a detailed checklist that you can refer to before proceeding towards a travel. Additionally, some of the templates available under this category are specially meant for business proposes to ensure that shipments sent through sea reaches it pre-defined destinations on time and in an appropriate manner. You can download and use these templates for personal, business, and corporate use to keep a track of your items and plan for almost everything you’ll need on a vacation. Providing you space for mentioning your name, address, contact info, and other valid details, all of these templates can assist in reducing your luggage by eliminating all the unnecessary stuff that your don’t need while on vacations. Offering you high-end support for packaging all your belongings and stuff in legible and organized manner, these templates can help in creating and printing readymade packing list to ensure that you never miss out anything important.